Leakers reportedly found most of what’s coming with the Festivus event. A special Fortnite: Battle Royale in-game event featuring EDM DJ Marshmello seems bound to happen. 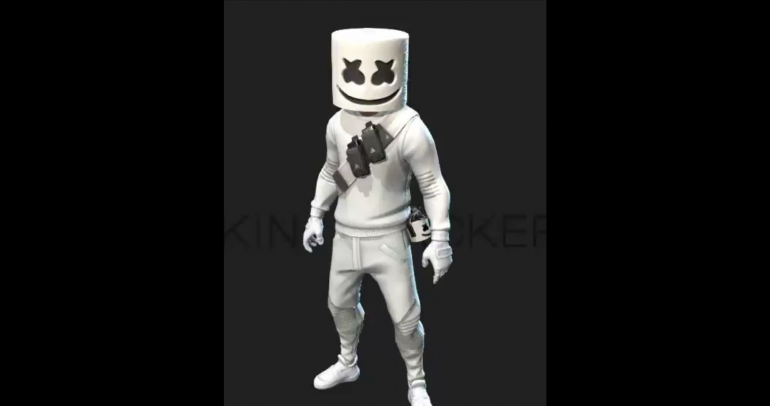 After yesterday’s Fortnite v7.30 game update, leakers found several game files with cosmetic items themed after Marshmello, such as a pickaxe with his mask called “Marshy Smasher” and dances called “Marsh Walk” and “Keep it Mello.” Leaker FortTory revealed several assets of what seems to be lights, dance floors, and DJ tables to be added to Fortnite. FortTory also found a hidden event called “Festivus.” When we connect all this information with other images both leakers revealed, we may have a better idea of what exactly is this Fortnite and Marshmello collaboration. Please note that all the information below is unofficial since it was revealed by several leakers, who are not Epic employees. It’s impossible at this time to say if any of this information is real. But all these leakers are trusted within the Fortnite community and are generally spot-on with their findings. The event is likely happening on Saturday, Feb. 2 at 1pm CT in Pleasant Park. Lucas7yoshi found an asset with a Marshmello poster that shows this information. What we know is that part of the Marshmello and Fortnite collaboration will be a one-time event mixed with another long event, which could come as a new Limited Time Mode and a new set of challenges. Leaker XTigerHyperX has revealed a huge list of sound effects Epic made for Festivus. The sounds he showed off are crowd and firework effects, which might be part of in-game Marshmello performance. Some people tried to reproduce the Festivus event with an exploit, but the closest they got was playing a song from the event from a replay file, as shown by John Gabbana. Leakers also found that a Marshmello NPC could appear to play at Pleasant Park. ShiinaBR showed off a Marshmello model, while Lucas7yoshi claims it’s most likely an NPC since it has no head animation when loaded as a Battle Royale skin, as shown by s1l0x. If Marshmello is coming for this event as an NPC, chances are he’ll drop in Pleasant Park using a glider with sparkles and explosions of some kind, leaker FortTory found. Epic seems to have included several game modifiers for when Festivus starts, like low and null gravity, flying and bouncing capabilities, and skydiving. It’s not clear whether these modifiers will apply to players or to the environment. It seems that there will be an exclusive set of challenges coming with the Festivus event. FortTory first found a pack that seems to confirm a new set of challenges, then FortniteES revealed what they claim to be the full list of Festivus challenges. This is a hint that whatever happens during the Marshmello event, it will last more than a single day. That’s all the leaked information about the Marshmello and Fortnite collaboration so far. Players who are eager to play during the event will have to wait until Feb. 2 to find out if Marshmello will be in the game and what changes he will bring to Battle Royale.